There is a new story on the web at CNN.com with the title Spiritual But Not Religious. Take a quick read and offer your comments here. The article is pretty balanced and probably fairly accurate at its description of the modern world. In my judgment the people interviewed make a profound error in thinking that one can ignore the church for which Jesus died (Acts 20:28; Hebrews 9:12; Hebrews 9:14) and seek salvation on their own. There is another issue however that is raised by this article. 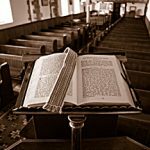 Has the present church become irrelevant to modern man? If so, is the problem with the Lord’s church itself or with the people who make up that church? Many who read this blog will defend the church as being divine in its origins and mission and therefore not the problem. That leaves the problem squarely on the shoulders of those people who are the church today. I fully understand that some people are not looking for the truth, do not desire it and will not accept it is it stares them in the face. But there are many others who have been “turned off” by church. Why? Has the modern church lost its way? Have we focused too much on serving the members and not enough on worshiping God? Have present day churches become too social and too entertainment oriented? I deeply desire your thoughts here on the blog. Bryant, I lived California in the mid-80s. I heard this phrase about as often as you hear "yall" in South. It was also the beginning of the New Age movement which later spread across the country.Recently I've attended services at the Church of the Highlands. In terms of sheer numbers thay are doing something right. Put the pendelum swings for me, I already miss the Meal. Unfortunately I think the answer to all 3 questions is yes. Hi Chuck, I appreciate you comment. I am a little surprised that more people didn’t have something to say but maybe we provoked some thinking. I agree with your answers and it is deeply disturbing. It’s as if the humanist thinking has snuck in through the back door. thanks for that encouraging word may God bless you. Amen.